Oh, here they come! The celebrities have arrived. My goodness, what stunning dresses! What handsome tuxedos! Get ready to ogle the world’s most famous celebrities! The Oscars are here – and you’re going to throw an Oscars Fancy Dress Party! 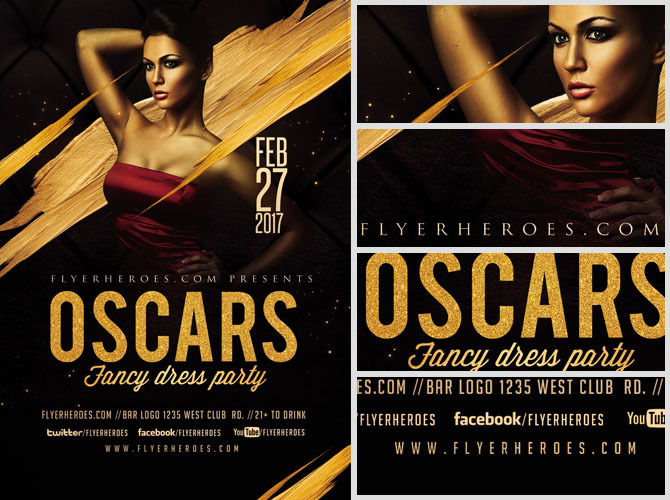 Make it genuine and promote your event with the Oscars Fancy Dress Party Flyer Template V4 from FlyerHeroes.com! 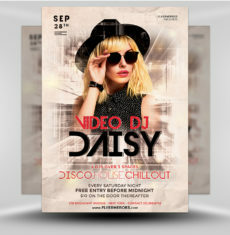 This flyer is all about cool, sleek, golden style. Let your friends know they need to dress to impress! 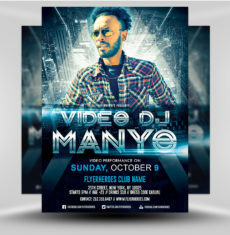 This flyer is expertly-designed by our team here at FlyerHeroes, and will definitely catch the eye of Hollywood’s best and brightest. Plus, it’s fully-customizable, so you can change all the text to reflect the details of your party! Where is it going down? When? What should the guests wear? Should they bring anything? Don’t forget to add in your social media contact and get the conversation started. 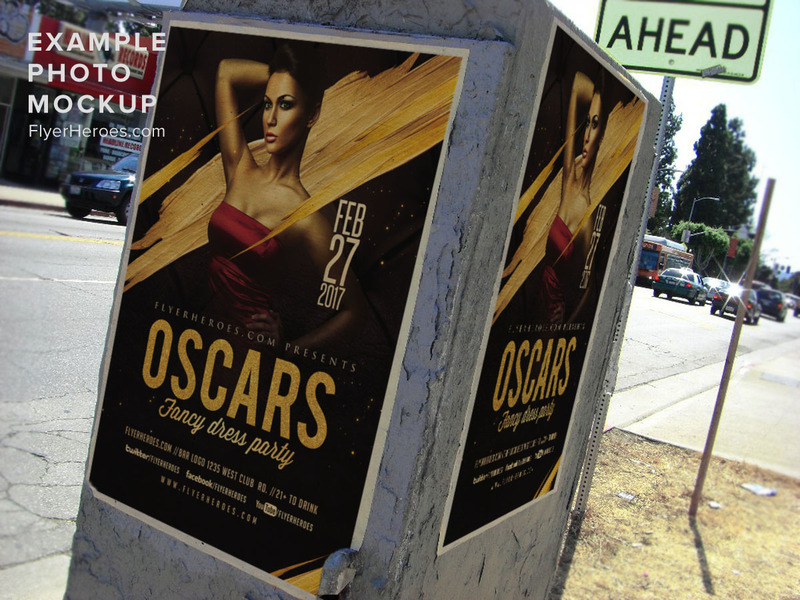 It’s Hollywood’s biggest night of the year, so celebrate in style with the Oscars Fancy Dress Party Flyer Template V4! Don’t worry if this flyer doesn’t win an award, because there are plenty to choose from here at FlyerHeroes! Check out our other designs below! As the red carpet unfolds, who will look the best? Who will take home the gold? 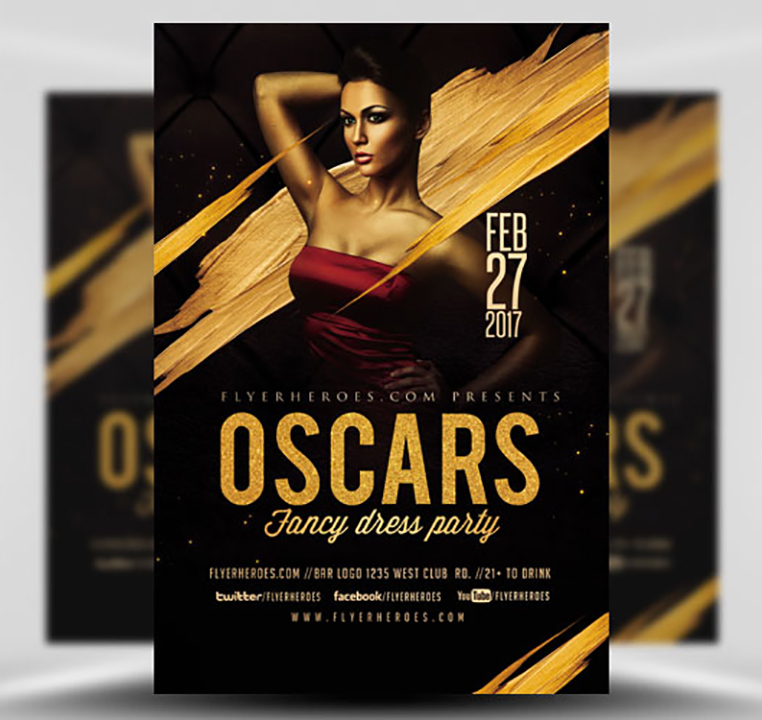 Find out with the Oscars Fancy Dress Party Flyer Template V4! 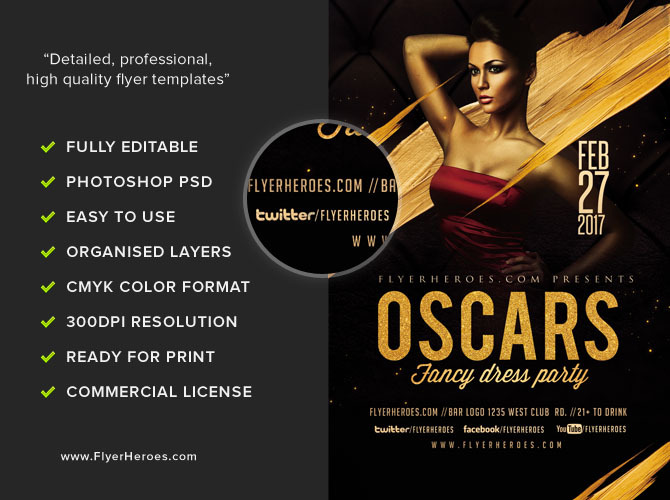 Oscars Fancy Dress Party Flyer Template V4 is a premium Photoshop PSD flyer / poster template designed by FlyerHeroes to be used with Photoshop CS4 and higher.